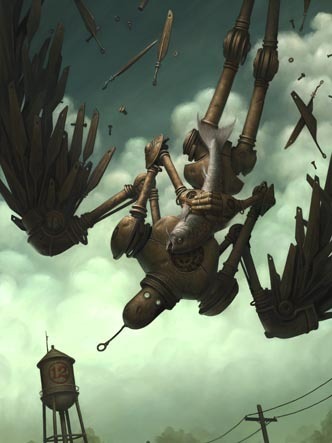 Ever wonder how a flying robot goes fishing? I mean, who hasn’t? As the above painting illustrates, Washington-based artist Brian Despain might just have the answer. Fresh off another strong showing at Roq La Rue Gallery in Seattle, Brian was kind enough to take some time out of his busy schedule to sit down and answer some questions with Arrested Motion. Blending superb painting chops, bold iconography, and poignant storytelling, Brian provides an artistic narrative rich in aesthetic qualities and riddled with satirical expressions. 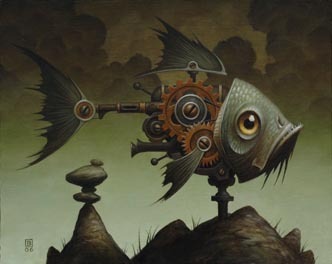 After gaining his BFA from Eastern Michigan University, grinding out many years in various illustration venues, and now with 4 years of gallery experience under his belt, he has unquestionably found his niche in the world of fine art. With a foreboding tension and an inescapable ambiguity, Despain’s art serves as a timeless snapshot of a world that could be, or that never was, all while providing the viewer a chance to examine their own place in it all. Please take a moment to continue reading, as Brian sheds some light on art, life, and a great many things in between. Arrested Motion: What lead you down the path to becoming an artist? Was there anything or anyone specific during your childhood that opened your eyes to art? Where you live, your parents, your favorite cartoon, art school, etc? 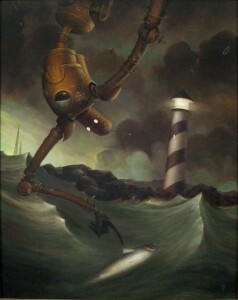 Brian Despain: God. I think as clichÃ©d as it sounds I was always just destined to be an artist. I did a huge amount of drawing as a kid, as most kids do, itâ€™s just that I continued on. Couldnâ€™t stop. And when it came time to go out there in the real world and make a living, well, I could only do the one thing so, here we are. AM: How long have you been creating your art at a professional level? When youâ€™re not painting for gallery exhibits, what are you doing? BD: I got my first professional gig when I was eighteen. I illustrated a bunch of those really cheesy cartoon maps of cities. Since then Iâ€™ve done just about everything else. Iâ€™ve had jobs from graphic design to photo-retouching to straight up illustration. Now my day job is as a concept artist for the video game industryâ€¦ oh yeah and I paint. AM: What artists – both from yesteryear and today – have informed your development as an artist the most? Any current favorites? AM: How would you describe your painting style to someone who is new to your work? BD: Lucky. I swear to god half the time Iâ€™ve got no idea where Iâ€™m going and most of the time Iâ€™m pretty confused as to how I got there. AM: For many collectors of the “lowbrow” flavor, your inclusion in the three-person group show at Roq La Rue last November was their first exposure to your work. How long have you been showing in galleries? Would you consider that your most successful foray into the gallery world? What is it like to know that your art has generated a legion of fans eager to purchase an original painting? BD: Iâ€™ve been showing in galleries for a little over three or four years now. One day I up and decided that I was sick and tired of being an illustrator all day and then going home to do the same thing so I picked up a brush and taught myself oil paintingâ€¦ Okay, that sounds a bit pretentious so let me clarify. Iâ€™d been a digital artist (painting on the computer.) since about â€™95 so I had a while to actually learn how to put together an image. The rest was understanding the medium and I had a wealth of friends to draw from there. Still itâ€™s been an interesting and often frustrating journey. As far as the legion of fans? Itâ€™s great, more so in the fact that someone can appreciate the work Iâ€™ve done rather than the whole attention and adoration aspect. But hell, thatâ€™s pretty great too. AM: For someone who watches the art world from the sidelines, it’s always enlightening to learn of an artistâ€™s approach to a particular painting. Could you run me through a typical Despain painting from concept to completion? The different steps, mediums, length of time taken, the â€œhappy accidentâ€, etc? The actual painting I do in multiple passes. The first pass is to establish base form and color, itâ€™s very rough and unfinished but allows me to see the direction of the piece and judge it against the color study. The second pass is where a majority of the finished work happens. The last pass is a refinement pass. Iâ€™ll not paint over the whole painting again, but instead I tighten up areas and push the highlights and deep shadows to really give the piece some pop. Then I finish up with a couple coats of varnish and just for fun I like to put on a final coat of a magic potion Iâ€™ve brewed with chickenâ€™s blood and fairy dust. AM: In a general sense, how would you say your worldview informs your artistic vocabulary? Are there any social, environmental, or political themes that you consciously â€“ or unconsciously â€“ weave into your work? BD: Really, I donâ€™t think it can be helped. In no small way we are the sum of all our experiences and unless oneâ€™s been living in a bubble their entire life all those things, social, environmental and political events and pressures will affect us. Since art is essentially the extension of an artist then it really canâ€™t be helped that in some way all those things are in there too. And yes, I do add my own themes as well. At this point I think I should clarify a little. Even though I am putting a lot of my ideology in my work (which again, canâ€™t be helped.) I believe that art is more than me creating a painting and you all enjoying it. I see art as a sort of exchange between the artist and viewer. I put forth a collection of images and you as a viewer, you give it life. I learned a long time ago that no matter the â€œmeaningsâ€ Iâ€™ve discovered in my paintings Iâ€™ve no way to dictate or enforce those meaning to a viewer. Furthermore the more I heard other peopleâ€™s interpretation of any given painting the more I realized that everyoneâ€™s interpretation is completely valid as itâ€™s coming from a relative perspective. I do use broad psychological triggers to inform a direction but I think the viewer needs to become part of the process to truly have a great piece of art. In short, if I force the viewer to think a certain way rather then let them come up with their own interpretation Iâ€™ve changed them, the viewer, from active participant to passive observer thus lessening the impact of the piece, thus lessening the whole of the experience. AM: Everyone knows robots rule! It seems you agree, as they play a central role in many of your paintings. 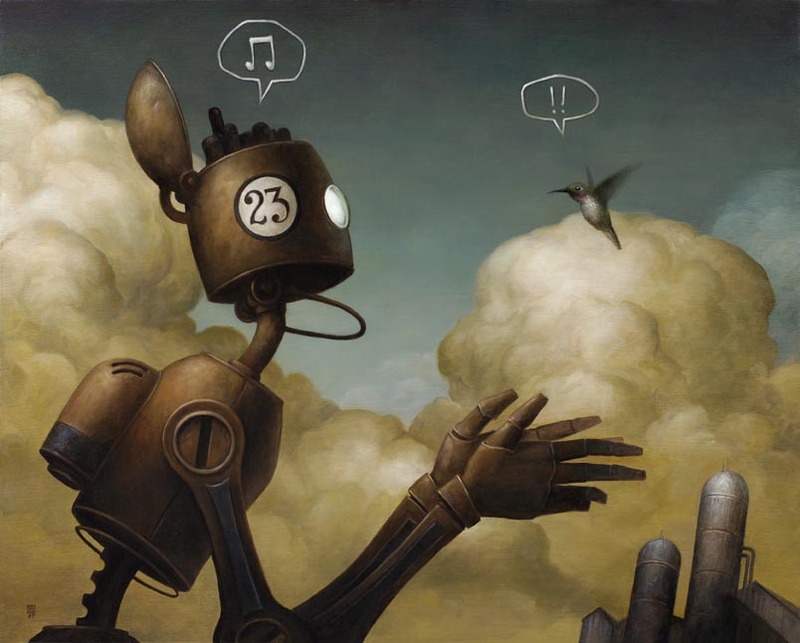 Is there any specific reason you use robots as the protagonists in your artistic story? You can be honest, is it just because…well…they rule?! Or is there some specific significance? BD: I do enjoy painting robots, but thatâ€™s not the only reason. As I mentioned earlier I strive to create images that appeal a viewer to take part in the artistic process. I do this by creating images that hit a broad chord rather than a single note. Using familiar, global emotional situations, things like love, loss, discovery, and fear, I give the viewer a broad direction to head, but let them discover the specific path. 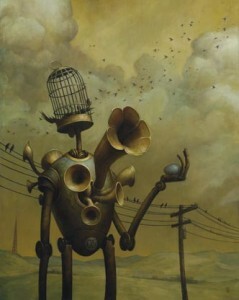 The robots allow the viewer to more easily step into this role. If I were to put â€œrealâ€ people in the same situations I think the reaction to my images would be vastly different. For instance a person seconds away from running into the ground from a great height would elicit a much stronger reaction than a robot, even though that robot seemingly shares all the same conscious traits as a living human. By using robots I can get a viewer to stand and stare a little longer, letting the image and the emotional context soak into their subconscious a little more. AM: To piggy back a littleâ€¦Your robots have been described as representations of the “everyman”, a universally character for your audience can identify with. Could you elaborate on this a little? BD: We as humans are prone towards vast amounts of empathy. When we see a situation where another human is in dire straits our hearts go out to them. This is all well and good but I want to take it further, I want a person to not only feel empathy but to literally put themselves in that position. Where an image of a person may evoke removed empathy the same image with a robot allows the viewer to literally put themselves in the robotâ€™s place, in a sense the robots become an avatar of everyone instead of being a specific person. 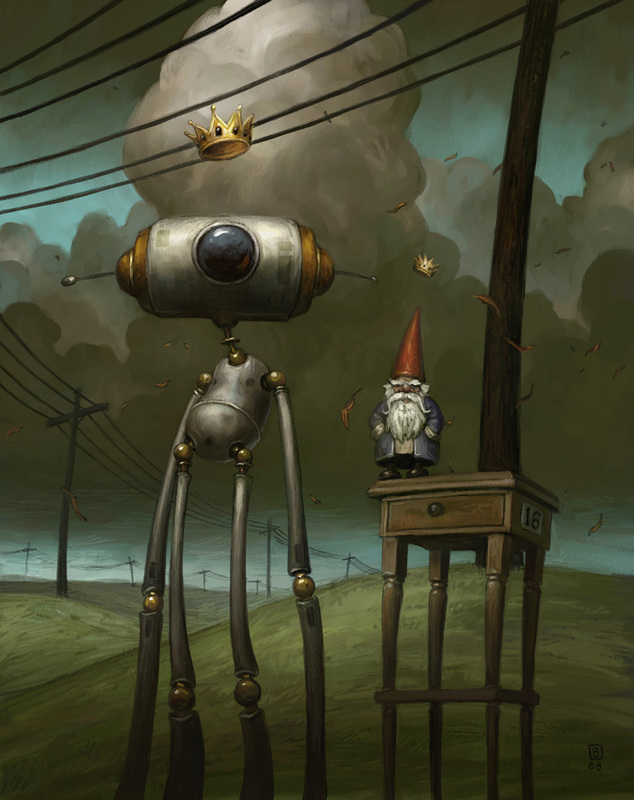 AM: What about some of the other reoccurring elements that populate your work; fish, skulls, wings, stone piles, and, most recently, garden gnomes (heck yeah!)? What are their origins? BD: Mostly theyâ€™re just stuff that triggered something in me. I do enjoy using recognizable shapes that have strong universal psychological potency, like skulls and fish, but a lot of the time I just let my subconscious have free reign and itâ€™ll put whatever it deems appropriate in there. For instance my first few sketches for â€œThe Exilesâ€ had the robot partnered with a giant bee. 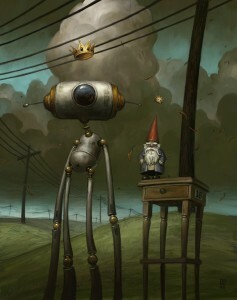 As the image progressed the bee got replaced by the gnome. It just worked better that way. Why? I have no conscious idea, ask my subconsciousâ€¦ Better yet, donâ€™t. AM: And your pieces tend to be set in desolate and, at times, dystopian landscapes, often with polluted, ominous skies overhead. 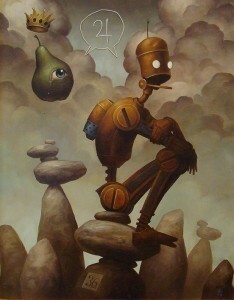 Is this a post-apocalyptic human world, your robots being the last relics of a society that is no more? Or are humans not a part of the picture? BD: Whenever I do a series of paintings I invariably give myself a set of â€œrulesâ€ to follow. This gives the series a more established, cohesive feel and also gives me some structure as well as challenges me when creating new images. One of the rules I developed for the â€œ100 robotsâ€ series is that though there can be signs of humans there would never be any humans in the images. This I felt heightened the sense of these robots living on the fringes of society. Either they are cast off or have removed themselves from the work-a-day world to exist on in a place of their own creation. They are the forgotten and the lost but at the same time are free of the chains that bind the society that created and ultimately forsook them. 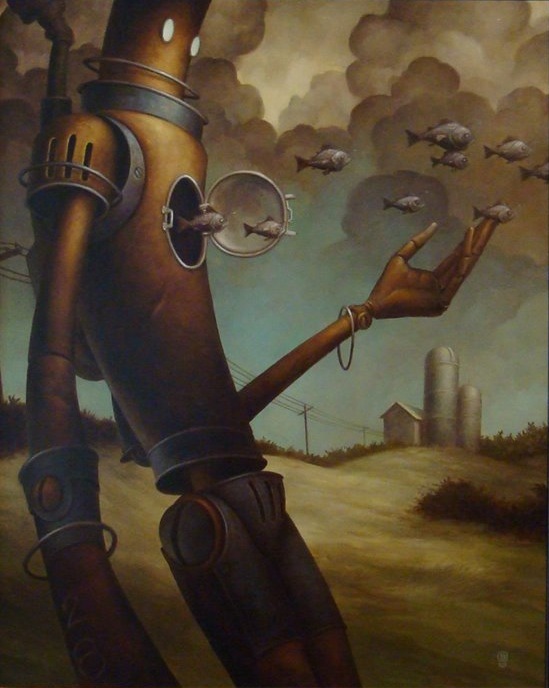 AM: Similarly, aside from a working tally to your “100 Robots” series, is there any special significance to the numbers that are incorporated into almost all of your paintings? BD: As I stated before my goal is to get the viewer to interact with the painting as much as possible. To achieve this result I try to include devices both familiar and at the same time mysterious. Fish are a good example of this. Fish are both instantly recognizable and yet live in such a foreign environment that we are hard pressed to ever fully understand them. Numbers fall into a unique place as well. We are, as a society, run by numbers. Time, dates, codes, math, all form a structure that we build our lives around, yet when pressed we donâ€™t think of numbers in that way. For example, holidays are all about the emotional aspects surrounding that particular holiday, not about the date itself. The number is simply a marker, important to a fault, but totally behind the scenes. In so much when I use a number in a painting it triggers a curiosity in people. Though people may ask â€œWhy is that number there?â€ what theyâ€™re really want to know is, â€œWhat is so important about that thing that it deserves an identity marker?â€ Thus the mystery deepens, thus the viewer delves further, thus the interaction between the viewer and the image is heightened and thus, the artistic process and more specifically the â€œArtâ€ is that much stronger. AM: The connection between artist and collector usually exists entirely through a painting alone. Above all else, what do you want viewers of your work to take away from their experience? BD: To tell you the truth I expect nothing. I try to instill a broad emotional context to my imagery using global psychological triggers, (color, composition, visual vocabulary, etc.) but beyond that I relish the idea that the experiences had by the viewers are as varied as the viewers themselves. Thatâ€™s not to say I donâ€™t thrill when someone tells me what an impact a particular painting has had with them but for me to expect that from everyone that views my work goes against my philosophy of letting the â€œArtâ€ happen as it will. AM: Your newest collection of paintings, entitled “The Water God”, currently being exhibited at Roq La Rue, was once again well received and sold-out quickly. Could you say a few words about this body of work? BD: As with all my works I try to instill a sense of emotion in the work. I find myself drawn to a sort of sustained, quiet melancholy and so it shows up a lot in my work. Not quite depression, not quite sadness, just that slow realization that life is going to throw you a curve or two. This last set I started after splitting and ultimately divorcing my wife of 11 years. It was a pretty amicable split but still I found that almost unwittingly I started putting a lot of the emotions Iâ€™d been feeling that past year into my work. â€œThe Escapeâ€ was all about the pain of letting go, â€œThey Talked of Tinâ€ the struggle of relationships and how, even though two people are saying the same thing, theyâ€™re still in complete disagreement, â€œGhostsâ€ was about being haunted by our past while feeling lost in our present, â€œThe Exilesâ€ was all about blind pride in the face of utter loss and last, â€œThe Water Godâ€ was about the sheer amount of fascination and obsession we can focus on something once beautiful but which is now so obviously past. And yet, all these paintings have for me also a sense of hope. They sit in that poignant moment of pain and melancholic introspection right before the healing starts. Funny enough, right after this last show I started seeing a wonderful woman and things are going pretty well. Perhaps my next show will be all spring and flowersâ€¦ but somehow I doubt that. AM: What are your plans for the future? Do you intend on becoming a more regular player in the gallery circuit or just showing in exhibits here and there as you see fit? Any upcoming shows you’d like to make your fans aware of? BD: Well, Iâ€™d like nothing better than to become a full time gallery artist, but truth of the matter is Iâ€™ve got a mortgage and a couple of cats to be kept in short-pants so for the time being Iâ€™m going to keep the day job. Perhaps someday Iâ€™ll jump in with both feet as a number of my friends and colleges have done but probably not tomorrowâ€¦ But who knows, tomorrow ain’t here yet. AM: What is something about yourself that might surprise our readers? Like maybe your a volunteer firefighter on the weekends…or not?! BD: Honestly thereâ€™s not much surprising about me. I tend to wear my heart on my sleeve and keep very few secretsâ€¦ Wait hereâ€™s one. I hate fish. Seriously. Iâ€™ve tried to eat and like it time and again but I just canâ€™t get over the taste. AM: And just for funâ€¦If you were to hit play on your car stero/iPod/8-track player, what would come on? BD: Most likely something soulful and melodic. Iâ€™ve been listening the hell out of Bon Iver, Band of Horses, Ben Sollee and Iron and Wine lately. I want to paint like they sing. Of course, then just to be difficult I throw on Eagles of Deathmetal and punch stuff. 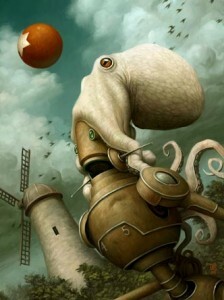 Categories: Art, Contemporary Art, Features, Interviews, Low Brow & Pop Surrealism. Tags: Brian Despain, Contemporary Art, Features, Interviews, Low Brow & Pop Surrealism.